Iceboating Hits The Big Time! Looks like our little old sport of iceboating made the front page of Sailing Anarchy, the most widely read sailing website out there- Very cool! Not only that but Patrick Rynne wrote a great essay on seeing the sport through a newcomer’s eyes. In early March we were chatting with our peeps at Sperry about shooting a Waterlust ice sailing video up in New England. We wanted to try out some rad new gear they are working on (I can’t say exactly what it is, but spoiler, it involves ice and having epic grip on your feet that they are famous for). I pinged some buddies up north and learned that El Niño had brought about pretty lousy ice conditions this season. Swinging west I turned my sights on the Midwest only to learn I had missed the DN North Americans by a couple days and temperatures were rising fast. It looked like our ice sailing adventure would have to wait until next season. But then we learned about Baikal Sailing Week. Lake Baikal is located in Siberia and it’s enormous. With an average depth over 1,000 feet and a length of 400 miles, it contains more freshwater than all the North American Great Lakes combined. It is estimated that 20% of the world’s unmelted freshwater is located here and is home to incredible biodiversity found nowhere else on Earth. 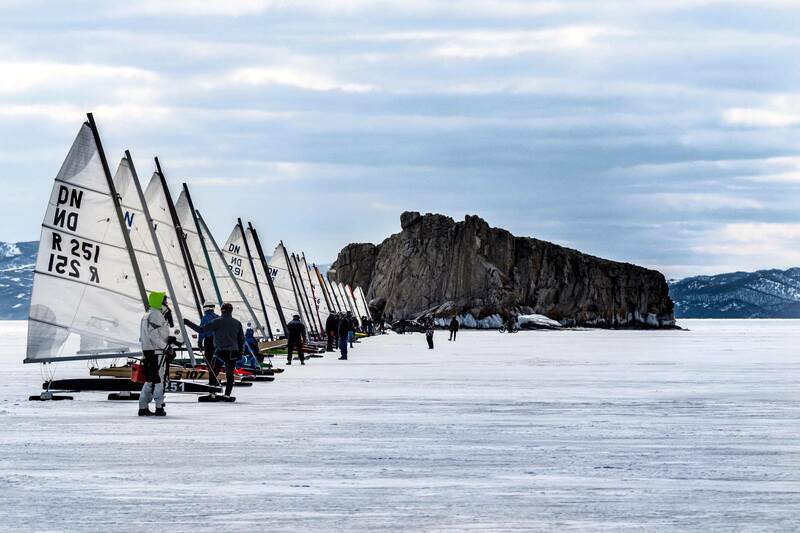 So it would seem obvious that this natural wonder of the world, so very far from civilization, would be the perfect venue for an international ice sailing regatta. We only had about a week to make travel arrangements, but thanks to the amazing members of the European DN fleet, we managed to get Russian visas and jumped on a plane. The event organizers were incredibly gracious in helping make it all happen, and I cannot thank them enough. This was my first taste of ice sailing camaraderie, similar to the Corinthian spirit found across all sailing disciplines, but even stronger. Ice sailors live somewhat of a nomadic life in that they typically must wait until the very last minute before choosing regatta venues. Once the call is made, everybody packs their bags and heads to whatever location is selected. “Ice scouts” scour near and far for that perfect thick and smooth ice that sends them rocketing over 60 mph to the next mark. The entire scene is unlike anything I’ve ever seen, and despite living in Florida, I want in! I knew absolutely nothing about the DN (Detroit News) iceboat class before getting here. To say these guys tech out would be a massive understatement. I thought foilers were bad, but they’ve got nothing on the ice crew. But that’s the nature of high performance sailing, the faster you go the more important tuning your kit becomes. Mental toughness plays a big role in this game because of the speed. Imagine missing a shift in your local one design fleet. Your buddies might pull 10 seconds ahead but they still seem within reach. Battling on to grind them down isn’t too hard to manage mentally. Now imagine what that 10 second gap looks like when you’re ripping around the buoys at a mile per minute! It’s over 800 feet, nearly 3 football fields! It takes a special kind of tenacity to keep your head in the game with those kind of distances lost and gained every moment. This is one reason why ice sailors, like foilers and other high performance racers, are always sniffing out an edge in their gear. Similar to the moth fleet, teching out and being social seem to go hand in hand. Beers in the tent and post regatta karate (you know that thing we all do when we use our hands to show how two boats were coming together) are accompanied with discussions on composite flex, steel metallurgy, and the all important concept of apparent wind. So far my experience with this fleet has been inspiring and humbling. I used to think 30 knots was quick and 40 knots was balls to the wall. These guys don’t even budge off their resting heart rate until then. Am I ruined forever? Will foiling now feel like slogging in a laser? Perhaps….but at the same time, I just discovered yet another epically fun aspect of our sport that I know nothing about, and that is what keeps me coming back for more! DN Worlds is in America next winter….perhaps just enough time to learn how to get around the course without killing myself? To follow the daily action here in Siberia the rest of the week, tune into or Facebook page or find us on Instagram or Twitter at @waterlust. We’re 12 hours ahead of EST, so when you’re sleeping we’re shooting and vice versa. This entry was posted on 04/06/2016 by Commodore James "T" Thieler DN US 5224. It was filed under 2016 Season .